This cute little shell bikini is the perfect accompaniment to mermaid tails and other sea creature props. 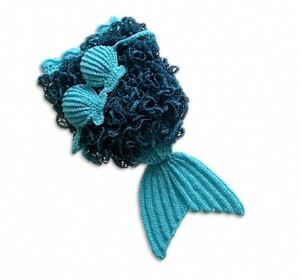 Also available as a part of a prop set with ruffle yarn mermaid tail here. Each shell measures approximately 10cm (4”) square. Made on their own, they can be used as standalone props or embellishments. Materials: Approximately 50g (180m) of DK weight yarn. Tools: 3.50mm hook and a wool needle for finishing. Yarn used in example: Wendy Mode 50% pure merino wool (shade 231). This entry was posted in Crochet, Featured, Photo Props on April 11, 2013 by Thomasina Cummings. This cute little mermaid photo prop with it shell bikini top and ruffled tail will make a fabulous addition to any photographer’s repertoire. This pattern has 12 pages containing both written and charted instructions for each item. A tutorial on working with ruffle yarn is also included. The tail measures 35cm (14”) in length (fin not included in measurement). Each shell measures approximately 10cm (4”) square. Made on their own, they can be used as standalone props or embellishments. The top edge, with its delicate shell trim, will reach baby’s tummy (it may be worked longer for use without bikini, if desired) and has a circumference of 35cm (16”) at its widest point. Directions are also provided for making a larger sized cocoon based on chest size and length requirements. The scales may be worked using any of the popular ruffle yarns. Illustrated instructions for use are included. This item is not suitable for sleeping in. You will need approximately 150g (540m) of DK weight yarn and 100g Ruffle Yarn in a contrasting/co-ordinating colour, a 3.50mm hook and a wool needle for finishing. Yarns used in example: Wendy Mode 50% pure merino wool (shade 231) and King Cole Krystal Glamour (shade 456). This entry was posted in Crochet, Featured, Photo Props on March 16, 2013 by Thomasina Cummings. These crochet snood patterns are available for £1.95 GBP each. 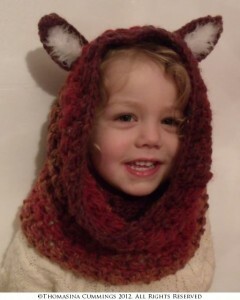 Better still, you can buy the bear snood and the foxy snood together for a reduced price of £2.90 with this link. Snuggly warm and ever so cute! 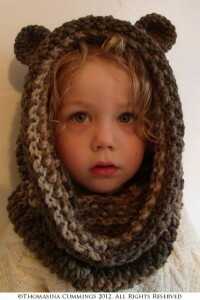 The crochet snood patterns give instructions to work in sizes to suit ages 1-3 years, 3-10 years and 10 – adult. There is no reason why the pattern cannot be worked smaller as a photo prop for babies but, I don’t recommend the use of a snood for small babies. For the fox, you will need 150-300g (200-400m) Patons Shadow Tweed in Red/Orange/Burgundy (6906) or similar chunky weight yarn, a 5.00mm and a 6.00mm hook, 10cm (4”) of white swansdown fur and a needle for neatening ends. For the bear, you will need 150-300g (360-720m) Patons Colour Works Aran in Earth Mix (82) or similar Aran weight yarn, a 5.00mm and a 6.00mm hook and a needle for neatening ends. Both patterns are written in UK terms with a table of US equivalents provided as applicable. This entry was posted in Crochet, Featured, Photo Props on January 8, 2013 by Thomasina Cummings. Ice skate, hockey skates, figure skates….whatever skates you decide you want!! 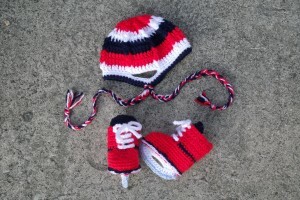 This pattern contains instructions for skates (0-3 months) and, as a bonus, a sports helmet in sizes to suit 0-3 years. 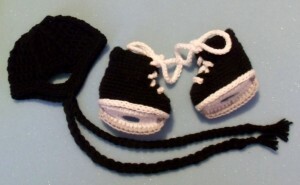 The crochet skates and helmet set is ideal for photo shoots or as a novelty baby shower gift. Baby skates (ice or hockey) measuring 3½” (9cm) long and 2” (5cm) wide – will fit babies in the 0-3 month age range. You will need 75m m of DK (8ply) yarn in each colour – white, grey and chosen contrasting colour, 3.50mm hook and two stitch markers. Can be worked without the blade for high top trainers. Measurements provided to check gauge as working, without the need for a swatch. Some testers trialled these in WW yarn and were able to increase the size of the skates to 3-6 months. Sports Helmet sizes 0-3 years included. You will need: up to 200m DK (8ply) yarn, a 3.50mm hook and wool needle for finishing. Pattern is written in UK terms with a table of US equivalents provided as applicable. This entry was posted in Crochet, Photo Props on October 28, 2012 by Thomasina Cummings. PDF Crochet Pattern now available here. 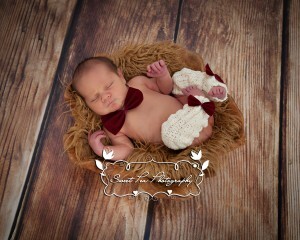 This sweet little crochet cocoon and hat set is snuggly and warm and makes a great photo prop or baby shower gift. Sizing to 18 months is provided so that you can make a snuggle-up-on-the-sofa cocoon for older babies and toddlers…..great for cuddling up to read bedtime stories on cold winter evenings! The hat is worked top down – the cocoon is worked bottom up. Both are worked in the round with a sideways dc ribbed border. Pattern for rosebud embellishment is included but item can be trimmed in any way desired. Materials: You may use any yarn for this project, although DK, Aran, 8ply, worsted weight and light bulky work best. Tools: Hook appropriate to chosen yarn and a wool needle for finishing. Gauge: not important as item is worked to given sizes not stitch count. Nice neat stitches in any yarn and hook combination will work. Instructions use UK abbreviations – a table of US equivalents is provided as applicable. This entry was posted in Crochet, Photo Props on October 25, 2012 by Thomasina Cummings. PDF Crochet Pattern now available to buy!! 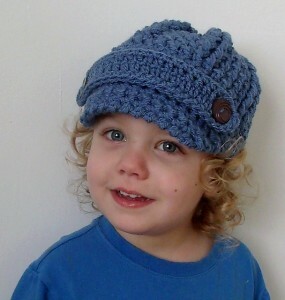 This simple and quick-to-work crochet newsboy hat can be made in any size from micro preemie to adult. An ideal stash buster, you can work it in any yarn you like. 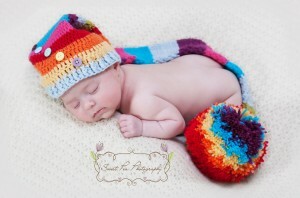 Materials: You may use any yarn for this project, although thicker yarns are best kept for the larger sizes – a micro preemie hat is unlikely to work so well in super chunky! Good combinations are DK with a 3.50mm hook, Aran (WW) with a 4.50mm hook and chunky (bulky) with a 5.50mm hook. The largest size uses approximately 100-150g (230-345m) double knit (8 ply). You will also need a hook (appropriate to chosen yarn), 2 buttons to trim the strap and a needle for neatening ends and stitching buttons on. This pattern is written in UK terms with a table of US equivalents as applicable. This entry was posted in Crochet, Featured, Photo Props on October 23, 2012 by Thomasina Cummings. The pattern for this oh-so-cute crochet sailor boy photo prop set can be made in a range of sizes from birth to 2 years. The set consists of a pull-on wrap, a collar and a jaunty marine-style hat to fit a 14-20” (35.5-51cm) head circumference. Materials: 270-450 m main colour, 100-135m contrasting colour, 3.50mm hook, 2 buttons to decorate the shorts and 2 stitch markers. In the examples shown, the main colour is white and the contrasting colour is blue. You may substitute different colours as preferred. Shorts Gauge: 14sts and 6 rows to 3” measured across treble section (worked in back loops). Where possible, you should obtain the baby’s rise to determine which size to follow. The rise is measured from the front belly button, through the legs and up the back, to around the same height as the starting point. Ages are only provided as an approximate guide, if the rise and waist measurements are not available. Waist sizes can be adjusted when working if you are unable to match exactly the options below. Age ranges are approximate. For best fit, please measure, whenever possible. The pattern is written in UK terms with a table of US equivalents where applicable. This entry was posted in Crochet, Photo Props on October 3, 2012 by Thomasina Cummings. 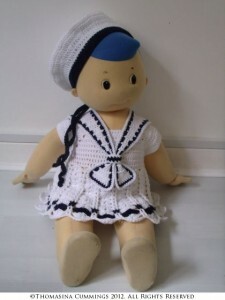 This oh-so-cute crochet sailor girl photo prop set can be made in a range of sizes from birth to 2 years and consists of a hat, a collar and a frilly dress. Worked from the neck down, the length of the dress is fully adjustable and could even be worked to a shorter length as a top over a frilly nappy/diaper wrap. The jaunty marine-style hat can be worked to fit a 14 – 20” (35.5 – 51cm) head circumference. Materials: 270 – 550 m main colour, 100 – 135m contrasting colour, 3.50mm hook and 1-3 buttons (sized to fit between pairs of trebles in the button band). Gauge: 12tr and 7 rows to 3” – it is perfectly fine if you get more or less rows to the 3” – the length is fully adjustable on both the body and the sleeves. This entry was posted in Crochet, Photo Props on September 28, 2012 by Thomasina Cummings. Winter is coming! Keep baby’s legs snuggly warm by crocheting these ribbed pattern leg warmers. Baby Leg Warmers are an ideal accessory for babies in cloth nappies – nothing better for showing off that super cool nappy wrap, keeping legs warm and still giving easy access at changing time. Crawling babies may also thank appreciate you protecting their knees on hard floors! 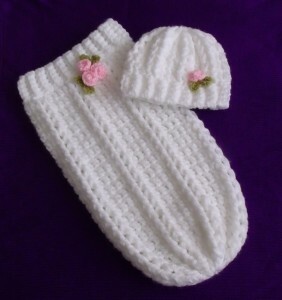 Each pair of leg warmers (0-6 or 6-12 months size) will use around 80g (230m) DK (8ply) yarn. Written instructions are given for 0-6 and 6-12 months. If you wish to make these in different sizes to those given, instructions are included for making any size – even adult if that is what you want! You will also need a 3.50mm hook and a needle for neatening ends. This entry was posted in Crochet, Photo Props on September 26, 2012 by Thomasina Cummings. 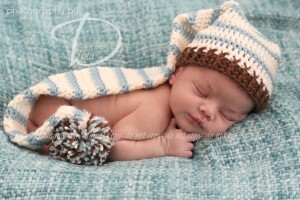 This simple-to-work hat can be made in any size, from newborn to adult, and in so many different ways. Add a fluffy trim and a pom-pom for a cute, newborn photo prop. Work it in stripes for Santa’s elves or maybe use your favourite team colours – the tail makes a great scarf to keep you warm on cold match days! Note: Baby sizes are provided with photo prop use in mind. This hat is not suitable for everyday wear in young babies. The tapering tail allows for great prop use, draping and covering baby in just the right places! Check out the oversized (6″) pompom on the rainbow one. Guaranteed to make baby look teeny tiny and like a real life Thumbelina. The post stitches in the brim give a lovely soft, stretchy band. Materials: Any yarn can be used but DK, 8-ply, worsted weight, Aran or light chunky will give the best results. Use with an appropriate sized hook. Maximum expected amounts 600m for adult male. Gauge – gauge is not important as long as you work to sizes indicated in the size chart. This pattern is written in UK terms with US equivalents provided as applicable. This entry was posted in Crochet, Photo Props on July 30, 2012 by Thomasina Cummings.